It’s about time we not only close out our NFC spotlights, but also finish off our division spotlights as a whole. And we figure there’s no better place to finish than right in Prime Time Fantasy Football’s home – the NFC East. 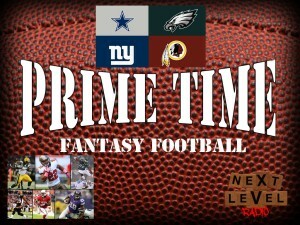 During episode nine of Prime Time Fantasy Football, Adam Gori, Joe Webster and I all talk about the fantasy impact of players from the NFC East. We’ll cover every player you should know about from the Philadelphia Eagles, Dallas Cowboys, New York Giants and Washington Redskins. We also continue our recap series, covering about half the games during Week 2 of the Preseason. We certainly don’t focus on the scores, but we do recap the happenings during the week that will be fantasy relevant for you. This includes the running back battles happening in Pittsburgh, Miami, Baltimore and Cleveland. Speaking of running backs, there is no battle at all in Philadelphia, with arguably the number 1 running back residing in the NFC East. Not all the decisions are that easy, however, which is why Adam, Joe and I will give you some sleepers you can target late in your drafts that may be happening this weekend. We’ll also do some “Over/Under” again, letting you know how guys stack up against their 2013 totals. We also move on in our positional rankings with the very thin running back position. This time around all three of us added our thoughts on the 40 best fantasy backs heading into the season. While the top 5 is similar, that’s where the likenesses end. See which list you agree with the most. Listen on! Click To Tweet –> Check out the NFC East Spotlight from @NXTLevelRadio, with hosts @AdamNextLevel, @joeyweb32 and @srichards31!